Spring comes a bit later here in Estes Park than other places throughout Colorado, thanks to our high altitude and the grand peaks that surround the valley. And although March 20th marks the first day of spring on the calendar, we’re still certain to see some snowfall throughout the area, which may come as a delightful surprise to visitors! While the temperatures sleepily rise here in Estes, the mountains are still caked in snowfall, and the valley starts to stir with activity once again — making this time of year special for those seeking views of beautiful snowy peaks, adventure on the trails, and calm, cozy leisure time in our cabins. It’s the perfect time to visit, whether you’re looking to snowshoe in Rocky Mountain National Park, or take a soak under the stars in a bubbly hot tub. Here are some early springtime activities that you can enjoy while we host your stay here at Rams Horn Village Resort. There’s plenty of fun to be had as the cold season comes to a close. You can hit the trails in a pair of snowshoes, take a tour with cross country skis, slip and slide on a sled — you name it. If you’re a seasoned skier, you can even backcountry ski in Rocky Mountain National Park (RMNP). 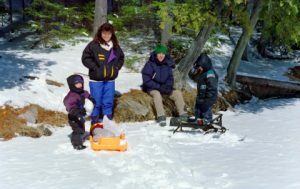 Here are a few favorite snow activities you can enjoy! If you’re heading for the trails to snowshoe for a mile or two, you can rent a pair of snowshoes in town for a reasonable price — there are rental companies that offer snowshoe rentals for $5 per day. Once you have a set, you can start exploring RMNP and trails throughout Estes. Feel free to check out the Cub Lake trail and The Pool Loop for a moderate hike that features waterfalls, and of course, Cub Lake. The Pool Loop is a 6-mile round trip hike. Or, if you’d like a shorter, but just as breathtaking journey, ascend up to Gem Lake, a local favorite. Gem Lake is 3.6 miles round trip, and it features some sections that are relatively steep, so be prepared! You can also try to summit Deer Mountain, for a longer hike that will leave you ready for a soak in the hot tub. This 6.2 mile hike peaks at Deer Mountain, whose elevation is just over 10,000 feet. Be sure to pack snacks, water, and plenty of warm gear! Soar over the snowy terrain on a pair of cross-country skis! You can rent a set of skis in town for about $20 per day, then head to your favorite ski-friendly trailhead. We recommend that you check out Sprague Lake if you’re a beginner, since the trail is relatively flat, plus the views are always glorious. Taking a loop around the lake is a 3.3 mile trek. If you’re more experienced and the conditions are right, you can also cross-country ski Trail Ridge Road. This old, one-lane, dirt road is closed to motor-vehicle traffic in the winter, enabling guests to hike, ski, or snow-bike their way up and down the trail. The trail is quite steep, however, so be sure you’re experienced enough to make the climb and descent! 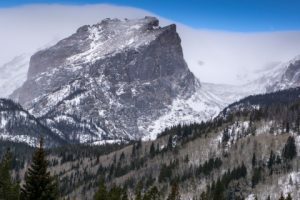 Backcountry skiing is a local tradition in Rocky Mountain National Park, and it’s the perfect activity for the adventure seeker. We recommend that skiers check out Hidden Valley, a hill that used to be an operating ski resort that now serves as excellent terrain for those willing to hoof it to the top before gliding down to the base. You can learn more about the many opportunities that RMNP has to offer from Visit Estes Park’s Back Country Skiing page. Once again, you can rent equipment in town if you don’t have your own! Hidden Valley is also a sledder’s dream. If you’re looking to soar over the snow on top of a tube, you can rent a tube or sled in town and head to RMNP. Just off of Trail Ridge Road, you’ll find Hidden Valley, where you can tote your tube or sled to the top, then cascade down the mountain. Take note, this is the only location in Rocky Mountain National Park where sledding is allowed. You can find affordable sled and tube rental rates in town. Fat Biking is an ideal spring sport around Estes, since you can cruise over any type of terrain, from snow to gravel. When the trails are partially covered in snow, fat biking proves to be an excellent way to make the most of it. You can rent a fat bike, and head for the nearest bike-accessible trail. Rent a fat bike in town, and ask around for the best trails for the current weather conditions! Whether you want to enjoy some hearty cuisine after a hard day of cross-country skiing, or you simply want to find some memorabilia to remember your visit to our cozy mountain town, you’ll love what downtown Estes Park has to offer. Take a stroll down Elkhorn Avenue, where local shops and restaurants abound. From chic clothing to tantalizing treats to breweries and burgers, you’ll find everything you could want out of a night on the town. If it’s quiet time that you are seeking, you’ll love the amenities that our cabins have to offer. You can laze around with a book on our plush sofas as you warm up by the fire. Or, you can head to one of our three hot tubs for a long soak. Our cabins are even outfitted with TVs and high-speed internet (the fastest that you’ll find in Estes!) if you’re exhausted from a day playing in the powdery stuff and looking for some down time. Take Advantage of This Season’s Specials Today! 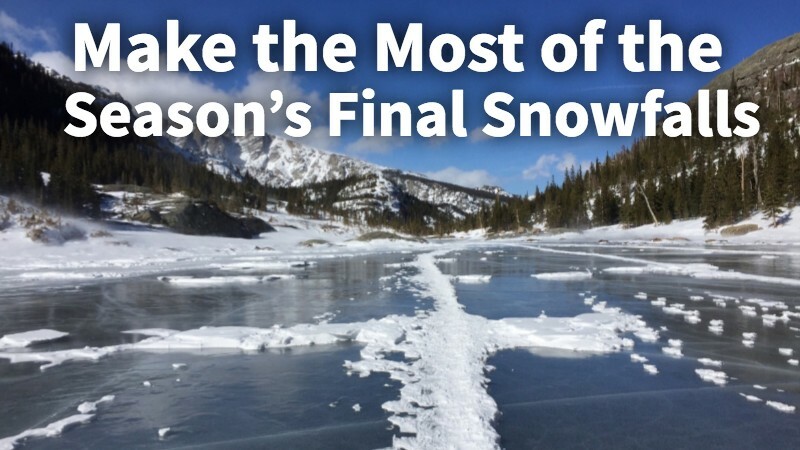 For those who want a final taste of winter — without the harsh temperatures of the coldest months of the year — now is the perfect time to visit Estes. Plus, we’re offering excellent specials for those who want to come stay at our resort. We currently offer two specials: You can stay for three days for the price of two with our Third Night Free Special, or you can save 33% on a reservation that is made within 10 days of your stay — that’s our Last Minute Winter and Spring Special. If you’re ready to book your Estes Park getaway, you can reach out to us today or check our cabin availability while you’re online.